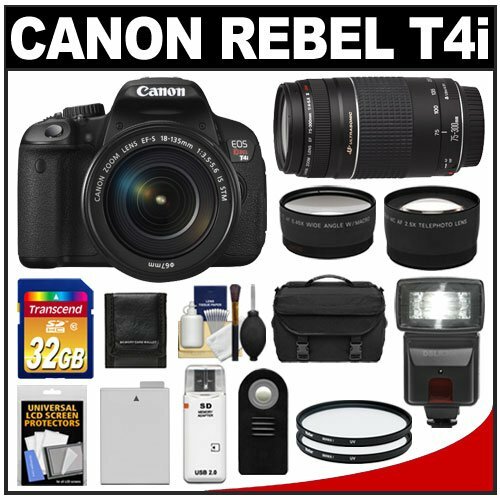 The Canon EOS Rebel T4i features include 18.0 Megapixel CMOS sensor, DIGIC 5 Image Processor, 5fps continuous shooting, ISO 12800, 3.0-inch Vari-angle Touch LCD, 9-point all cross-type AF, Movie Servo AF and much more! Included is the EF-S 18-135mm IS STM Lens which supports the Rebel T4i DSLR’s Movie Servo AF feature for smooth and quiet continuous AF during movie shooting. The Canon EF 75-300mm f/4-5.6 III Zoom Lens is a compact and lightweight 4x telephoto zoom lens ideal for shooting sports, portraits, and wildlife. This 2.5x Telephoto & .45x Wide-Angle Digital Lens Set extends your wide angle, telephoto and macro capabilities, while maintaining the autofocus and auto exposure operations.